We’d love your help. Let us know what’s wrong with this preview of Days of Wonder by Keith Stuart. A story about family, love and finding magic in everyday life, Days of Wonder is the most moving novel you'll read all year. Tom, single father to Hannah, is the manager of a tiny local theatre. On the same day each year, he and its colourful cast of part-time actors have staged a fantastical production just for his little girl, a moment of magic to make her childhood unfor A story about family, love and finding magic in everyday life, Days of Wonder is the most moving novel you'll read all year. But there is another reason behind these annual shows: the very first production followed Hannah's diagnosis with a heart condition that will end her life early. And now, with Hannah a funny, tough girl of fifteen, that time is coming. Hannah's heart is literally broken - and she can't bear the idea of her dad's breaking too. So she resolves to find a partner for Tom, someone else to love, to fill the space beside him. To ask other readers questions about Days of Wonder, please sign up. Tom, a single father to Hannah, is the manager od a tiny local theatre. On the same day each year, he and his cast of part-time actors have staged a fantastical production just for his little girl. Hannah was diagnosed with a serious heart condition just before her fifth birthday. After her diagnosis, Tom, Hannah's father, gets his amateur dramatic group to create a faerie cavalcade outside Hannah's bedroom window. Now they hold a fairytale every day on the same date at the Willow Tree Theatre. H Tom, a single father to Hannah, is the manager od a tiny local theatre. On the same day each year, he and his cast of part-time actors have staged a fantastical production just for his little girl. Hannah was diagnosed with a serious heart condition just before her fifth birthday. After her diagnosis, Tom, Hannah's father, gets his amateur dramatic group to create a faerie cavalcade outside Hannah's bedroom window. Now they hold a fairytale every day on the same date at the Willow Tree Theatre. Hannah's mother walked out on them when she was just three years old and her father has brought her up single handed ever since. Now aged fifteen, Hannah wants to find her father someone to lov before her time runs out. This story is told from Tom and Hannah's points of view. It's told mostly in the present but we do get some flashbacks to Hannah's past. The story does dip for a bit in the middle of this story. This is a very emotional read though there is humor in the crazy games and banter that Tom and Hannah share. I was pulled in from the begining and apart from the dip in the middle, I loved this book. What an absolutely emotional, riveting and engrossing read. This shows us how to be thankful in life no matter what life throws at us. There are brighter moments that shine through. Toms wife walked out on him and they're daughter while she was very young thus leaving him to manage as a one parent family. Hannah his daughter seems to be struggling one day so off he took her for tests, the worse comes to light, Hannah has a rare heart problem that will only get worse. Raising his daughter is not eas What an absolutely emotional, riveting and engrossing read. Raising his daughter is not easy and as she gets older and weaker we see the roles reverse where she is worried about him and his future and how he will manage. Its not all doom and gloom so don't be put off, this is the sweetest story of a daughter who loves and adores her father and a father who dotes on his daughter. He manages the local theatre and each year with the help of the part time cast of actors they put on a lovely show for Hannah. The wonders of the theatre are all around them, Hannah is now a little older and can see and appreciate what her father arranged each year. Then the Council want to shut it down. Hannah comes to the rescue as does others in the cast. There's a lovely lady named Margaret within these pages, she was one of my favourite characters along with Hannah's troubled boyfriend. I loved how this went full circle, it ends with his wife and his daughters offspring. Its a lovely satisfying book that brought some laughter, some home truths, lots of moments of thankfulness and counting our blessing and making the most of what we have, who we have and enjoying life. “There is such a thing as magic”. A great opening line. This is a book about magic. Not just the magic that you find in fairy tales and fantasy books, or even with comic book heroes – all of which get a mention. “I just mean the idea that incredible things are possible, and that they can be conjured into existence through will, effort and love.” This is the magic of stories, of people, of life and living. The book alternates chapter between two narrators; Tom – devoted father, actor and theatre m “There is such a thing as magic”. A great opening line. This is a book about magic. Not just the magic that you find in fairy tales and fantasy books, or even with comic book heroes – all of which get a mention. “I just mean the idea that incredible things are possible, and that they can be conjured into existence through will, effort and love.” This is the magic of stories, of people, of life and living. The book alternates chapter between two narrators; Tom – devoted father, actor and theatre manager; and Hannah – daughter with serious heart condition. Hannah, like all seriously ill children, is a fully mature adult at age fifteen. The Days of Wonder begin with her fifth birthday, immediately following her diagnosis, when Tom gets his amateur dramatic group to create a faerie cavalcade outside Hannah’s window at night. Thereafter, every birthday comes with a newly produced (by Hannah and Tom) fairy tale acted out at the Willow Tree Theatre. Hannah’s mother disappeared when she was three, but the theatre and its amateur dramatic group become her family. One of the strongest things about this book is its characters – not just Tom and Hannah – but all the theatre troupe get to play their parts. Everyone should have a Margaret in their lives. Someone with risqué anecdotes of their former life, that may or may not be true, but are always wonderful to hear, and who is always willing to listen, and to talk about any topic – including death – with a teenager (“It’s weird, but when we talk about life and more specifically its unavoidable conclusion, we do it as equals – we don’t bother to reassure each other. No one else in my life does that – they feel they have to protect me from any mention of death. Or more accurately, protect themselves.”). There is Ted, an accountant, who really wants to be a lion tamer. Actually, I made that bit up, but he does want to spice up his life by travelling around Europe in a classic motorcycle sidecar (with or without his wife). Natasha sees the theatre as her escape from the stifling demands of motherhood (“She told me that living in Somerset feels like being trapped in a cross between Groundhog Day and Deliverance. I looked up Deliverance on Google – I don’t think it was a compliment”). For Sally the theatre is somewhere she can finally get to use her organisational skills, and grow in confidence. Outside of the theatre there is Callum, in whom Hannah has absolutely no interest at all. She might even believe that if she says it often enough. Like Hannah, Callum is seriously into comics. And like Hannah, he has his own health issues, as does her friend, Daisy (“Sometimes I forget she’s broken like me. While I’m hiding in the theatre or reading comics, she’s out drinking and shagging. She’s so much better at being chronically ill than I am”). Hannah knows she “could drop dead at any second” and feels unable to plan for her own future. However, she does feel the need to plan for her father’s: “When you’re this sick, you learn really fast that you have to protect your parents”. With the connivance of Sally, Hannah starts to set up some blind dates for Tom – none of which go as planned. I got so invested in the characters in this book, especially Hannah, and expected to lose her any time. I spent the first third of the book checking on how far through I was – 10% that means Hannah lives at least another 70%, 20% she has another 60% of the story to go … And then suddenly I switched, and watched her LIVE. Soon after, Tom also realised that she had grown up, and that he needed to loosen the apron strings – just a little. The story, then, got very emotional. Never saccharine. Just honest-to-goodness emotional. I started blubbing – happens very rarely, but I just could not help it. The ending is just magical – that is, the ending of the current story. The epilogue ties up some loose ends, but isn’t really needed. This is a truly wonderful story, and I recommend it to anyone with a heart – broken or otherwise. “This is what I’ve always understood about the theatre – it is a place of possibilities, of magic – it is not bound by the rules the rest of the world has to follow … life always seeks to limit you, but it can’t do that here. The world is as big as you want it to be and it lasts as long as memory”. Warning: do not read this book in public, if you are in any way shape or form emotional! This is the story of Hannah, who just before her 5th birthday, was diagnosed with a serious heart condition called Cardiomyopathy. Now just before her 16th birthday she is seeing the effects on her body that the condition can cause. Tiredness, fainting, breathlessness, etc. The doctors don’t know how long her heart will last. Her single father Tom is the manager of the local theatre and every year for her birthday he has put on a show for his daughter to celebrate. However, the council is after closing the theatre down to make way for housing. It’s not just a building though, the theatre is part of both of their lives. It how he kept going when all around him was crumbling apart. It how the magic was kept alive inside of Hannah. It’s where the extended family of actor and actresses gather. All who have been here for the pair of them for the last ten years. This is also the story of a young girl with a rare illness coming to terms with her life and trying to live it to the full. ‘Days of Wonder’ is one of the most beautiful books that I have ever had the pleasure of reading. keith Stuart’s first book, ‘A Boy Made of Blocks’ was amazing and set the bar high. This second book has pushed that bar even higher. It is utterly captivating and if I could award it more than five stars I would. The characters have all been written with such realistic qualities, not just our dual narrators, Tom and Hannah either who I adored, but every one of the vast array of secondary characters too. It doesn’t feel like you are reading a fictional book, it feels like you are reading about real life events, written by real people, with such honesty. The story is heartfelt and so poignant. It is funny and touching at the same time. It gets inside of you and becomes part of you. From the opening scene to the very last page, this book will play with your emotions. Now I’m not one to get teary-eyed, but the epilogue got me. I read this authors previous book A Boy Made Of Blocks and loved it. I’ve got to admit I was t sure the author could write another to the level of the previous book but he did well with this story. This story is told through two points of view- Tom and his daughter Hannah. When Hannah is four years old they find out she has a serious heart condition. This affects both their lives as her health on a daily basis isn’t good. On each of her birthdays Tom puts on a show at the local theatre that he m I read this authors previous book A Boy Made Of Blocks and loved it. I’ve got to admit I was t sure the author could write another to the level of the previous book but he did well with this story. This story is told through two points of view- Tom and his daughter Hannah. When Hannah is four years old they find out she has a serious heart condition. This affects both their lives as her health on a daily basis isn’t good. On each of her birthdays Tom puts on a show at the local theatre that he manages to celebrate. Unfortunately the council is threatening to close the theatre. Full review to follow on the 4th of June as part of the blog tour. I absolutely loved "A Boy Made of Blocks" when I read it a couple of years ago so I was beyond excited when I was invited to read this book. It's not out for a while and I usually read my review books close to their publication dates but I just had to start this one early as I was too excited and couldn't wait. I was also a little scared as I had very high expectations. Bear in mind that my main go to reads are crime fiction, the gorier the better so to say that this is not my usual cup of tea w I absolutely loved "A Boy Made of Blocks" when I read it a couple of years ago so I was beyond excited when I was invited to read this book. It's not out for a while and I usually read my review books close to their publication dates but I just had to start this one early as I was too excited and couldn't wait. I was also a little scared as I had very high expectations. Bear in mind that my main go to reads are crime fiction, the gorier the better so to say that this is not my usual cup of tea would be an understatement. Well, what can I possibly say that can do this book justice? My words will never be enough to be able to get across the way this book affected me. Me, a bit of a hard nose cow, reduced to big sobbing tears at times by the powerful emotions I experience whilst read this book. Tears of pain, but also tears of joy, relief and, occasionally, tears of laughter. It's a magical tale that is beyond moving in content. It's the story of a family; not all blood related I hasten to add. Tom is a single father to Hannah. A hard enough job I would imagine, having to pick up the pieces after Hannah's mother left them and bringing her up solo, but then Hannah starts to fall ill and is diagnosed with a serious heart condition. Determined to make her life as special as he can in the time they have left together, Tom recruits all his friends at the theatre where he works to help him make each and every birthday special for his little girl by staging a play for her based mostly on the fairytales she loves. She soon starts to join in with the production process and the theatre and its people become a big part of her life too. But she is rapidly growing up and starting to find her own way in the world and her thoughts start to settle on what happens when she's gone. What will happen to her father? He has dedicated his life to her to the detriment of his own. Or so it seems to her. She thinks he has looked after her long enough and now it's her turn to look out for him. It's told from the POVs of both Tom and Hannah in the present with some flashbacks to Hannah's past. I found this to be a very effective way of portraying the story told within and it was easy to follow as both characters have their own distinctive voice. Oh. My, days. I'm not usually a very emotional reader but I think I invested my whole soul into this book. If I could have jumped in and joined the cast I would have. I made friends in this book. Friends that I am really going to miss. People that have made my life richer for their inclusion. People that have both challenged and changed the way I look at certain things. People that I grew to love, admire, argue with, fall out with, make up with, the whole shebang. In fact, I said to someone when I was about 80% though that I really didn't want to finish the book. Despite wanting and needing to know what happens, I was very reluctant to carry on, knowing that it would soon be all over and I would have to leave my new friends behind and go on without them. I am not going to speak about any of the characters individually here as I really think they are best off met and got to know as the author intends them to be. Suffice to say that they are are brilliantly drawn and real, so very real. This author definitely has a big talent with regard to characterisation and character development. Boy did I have a big book hangover when I finished. Normally when I finish a book I go straight on to the next one. It is very rare (so rare I can't remember the last time) for me to not want to pick up another book and crack on. But I finished this one at about tea time Friday and couldn't pick up another one until about the same time the next day. I was spent, exhausted, emotional, affected by what I had read. I do have to just mention that although the book is quite heavy emotional wise, it never gets too heavy. It is very well balanced all told. It's a book I feel very privileged to have read. It's a story which will stay with me for a while yet. It might also deserve a re-read in the future; another thing I very rarely do. It has also catapulted itself into my top five reads of all time. And I've read a lot of books... Mr Stuart, how are you possibly going to follow this? This book really did make me wonder – how can Keith Stuart possibly follow A Boy Made of Blocks? Believe me, he can and he has! A story about a young girl with a life-limiting heart condition, brought up by her single father who runs a provincial theatre that’s on its uppers, could have been so many things. It could have been depressing, or sentimental. It’s neither. Hannah is an edgy, intelligent girl who, though haunted by her probably lack of future, though often scared, takes life by the hor This book really did make me wonder – how can Keith Stuart possibly follow A Boy Made of Blocks? Believe me, he can and he has! A story about a young girl with a life-limiting heart condition, brought up by her single father who runs a provincial theatre that’s on its uppers, could have been so many things. It could have been depressing, or sentimental. It’s neither. Hannah is an edgy, intelligent girl who, though haunted by her probably lack of future, though often scared, takes life by the horns and twists them. She’s trying to fix her dad up with a woman ‘for afterwards,’ so he’s not alone. It’s a story about the magic of stories. About not giving in, and believing in each other, and of course, about love. Both major characters are believable and funny. You feel their pain, you laugh with their joy. It’s brilliantly done and backed up with a cast of lovely characters, each with their own troubles. I adore this book. I loved A Boy Made of Blocks but this one blew my mind. Its the best book I've read this year so far and in my top 3 all time favourites. I instantly connected to the characters, in particular Tom and Hannah. The love they had as father and daughter was perfectly written in my opinion. Their crazy games and banter was so funny and I laughed a lot throughout but their love and respect for each other shone through. Margaret was another favourite character for me, I would love to have a friend like h I loved A Boy Made of Blocks but this one blew my mind. Its the best book I've read this year so far and in my top 3 all time favourites. Margaret was another favourite character for me, I would love to have a friend like her. Even at her age she was hilarious, caring and a very special lady. I've only been to the theatre a handful of times but this story makes me want go. The theatre staff were a family, they had their good times and bad times but were always there for each other no matter what. The author is an amazing writer, he draws you in from the first page, makes you laugh and cry, sometimes he made me laugh then cry in just one sentence. He described the characters perfectly (I have images in my head of every one of them). I felt I was with them throughout their journey, in the same room with them listening to their conversations. I was inside their world. Life-affirming, warm and moving father-daughter tale with a touch of magic and a lot of heart. I loved Stuart's first and unhesitatingly knew I'd want to read this, his next. While the story is rather different, the author still takes us on a journey with a sympathetic family, with unspoken issues and deep-seated worries. Instead of centring round a child with autism, the heart of Hannah's family is just that - Hannah's heart. Since childhood, she and her father have known that her condition is g Life-affirming, warm and moving father-daughter tale with a touch of magic and a lot of heart. "I'd found this silly way to lighten the darkness, and it had worked" - Tom and Hannah take turns narrating and their dual perspective worked for me, I couldn't wait to see how each viewed the same scenes as the other had. It would be very hard not to fall for Hannah and Tom, such a loving father who has always gone the extra mile to make his daughter smile, and the literate Hannah with a witty and snide tongue who is facing fear head-on and not backing down. And it's not just them - there are a whole series of stand-out minor characters with some fleshed-out backstories and who are just as memorable as the lead pair. An eccentric elderly actress, a date Tom meets, are just two that added secondary stories that I was just as invested in as Tom and Hannah's. The story feels familiar in some of the turns, but doesn't conform to lazy writing. It's the sort of book you turn to for a lift, a a warm glow and to meet old friends. This is material ripe for filming, a short series or a film, the characters will transfer well to this medium and there are juicy lines for many of the roles. I laughed openly several times, joyfully. The author feels like a professional at influencing the reader's emotions, I just wanted to hand over my keys and follow his road towards the end... knowing what could be ahead. The ending was as poignant as I had been expecting, very beautifully concluded. Just wonderful, a delicately finished story full of joy, loyalty, heartache and love. Oh my goodness, I LOVED this sensitively written, beautiful book! Tom is the perfect dad - funny, empathetic and supportive of Hannah. Let's face it, fifteen is a tricky age and Hannah has a bit of the rebellious teenager in her too, even if most of the time she just doesn't have the energy to play up too much. I loved the references sprinkled liberally throughout this book: to plays, playwrights, movies and comics. I also enjoyed the relationships that Tom and Hannah had with each other as well Oh my goodness, I LOVED this sensitively written, beautiful book! I loved the references sprinkled liberally throughout this book: to plays, playwrights, movies and comics. I also enjoyed the relationships that Tom and Hannah had with each other as well as with their close circle of friends, just wonderful. Hard to categorise this book, actually. I found myself cheering both Hannah and Tom on and being totally enchanted by both of them. I thought it might be a bit of a tear jerker of a book but it wasn't really, there was too much good stuff going on! 5 big stars for this book, would give it more if I could. Thank you to NetGalley and Little, Brown Book Group. All opinions expressed in this review are entirely my own. What a deeply moving, beautiful book. I didn’t think Keith’s novel A boy made of blocks could be topped, but he’s done it. 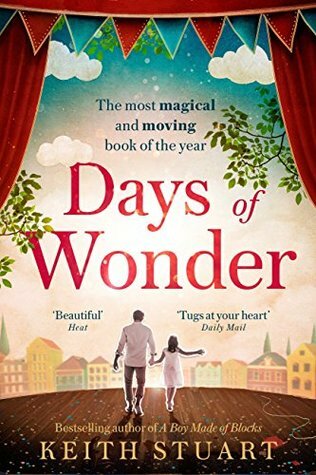 Days of Wonder is a novel about love, life and magic and one in which Keith has again, provided us with a story based on his love of the theatre, he thought this would be an interesting and supportive place for his protagonist Hannah. Tom, single father to Hannah, comes across as an overprotective father, he manages the local theatre where Hannah grows up. During Hannah’s early What a deeply moving, beautiful book. I didn’t think Keith’s novel A boy made of blocks could be topped, but he’s done it. During Hannah’s early childhood, she is diagnosed with a heart condition which will end her life early – Dilated Cardiomyopathy which affects the walls of heart, her heart beat is irregular and the blood isn’t pumped very efficiently. On the same day every year (usually Hannah’s birthday) Tom and the cast of Willow Tree theatre put on a production for Hannah. In this moving book, Hannah and Tom have more than one fight on their hands, not just Hannah and her illness but the theatre is also threatened with closure. This book is told from both Tom and Hannah’s perspectives. I got a lot from this book and I’m sure you all will too. This book deserves a standing ovation. When I read the blurb I thought this may be unbearably sad but in truth I found it uplifting. That’s not to say there were no tears. Ton and Hannah are very likeable characters and you definitely feel the love between them. All the characters felt real and most had their own everyday issues to contend with. Collectively the theatre group showed what can be achieved when you have a common purpose. I need to mention Margaret too, she’s definitely someone you w This book deserves a standing ovation. When I read the blurb I thought this may be unbearably sad but in truth I found it uplifting. That’s not to say there were no tears. Ton and Hannah are very likeable characters and you definitely feel the love between them. All the characters felt real and most had their own everyday issues to contend with. Collectively the theatre group showed what can be achieved when you have a common purpose. I need to mention Margaret too, she’s definitely someone you would want to take afternoon tea with. There are some really funny almost slapstick moments and the entire book is just a joy to read. I loved it and highly recommend it and it’s a solid five star rating. Such a sweet heartbreaking story. Just goes to show you never know what goes on in people’s lives! This story is about Hannah and her heart condition but it’s so much more! It’s about all the people that rallied around her in her time of need! I really enjoyed it! Het hele leven in één keer is een roman over liefde, zorgen voor elkaar, leven met de dood, omgaan met tegenslag in het leven en de kracht van verhalen en magie. Een boek om te lezen met afwisselend een lach, een traan of een brok in je keel, en waar je vooral moet zorgen voor voldoende tijd, want er is steeds wel een reden om toch nog even verder te willen lezen. I was such a huge fan of A Boy Made Of Blocks so you can imagine my delight when I was asked to be on the blog tour for his next book, Days Of Wonder. I did initially approach this book with a bit of trepidation as I didn’t think it would be able to be as good as A Boy Made Of Blocks. I was wrong! This book is just so wonderfully magical and heart warming. Some of the descriptions of the things Hannah’s dad had done for her in her childhood were brilliant to read about and brought a lump to my I was such a huge fan of A Boy Made Of Blocks so you can imagine my delight when I was asked to be on the blog tour for his next book, Days Of Wonder. I did initially approach this book with a bit of trepidation as I didn’t think it would be able to be as good as A Boy Made Of Blocks. I was wrong! This book is just so wonderfully magical and heart warming. Some of the descriptions of the things Hannah’s dad had done for her in her childhood were brilliant to read about and brought a lump to my throat. The wonderful descriptions just let me imagine the scenes from a child’s point of view which let me imagine the sheer awe Hannah must have felt on experiencing those things. The father – daughter relationship that Tom and Hannah have is just incredible and so lovely to read about. It was great to read about the little silly games they played and how much they obviously cared for each other. They both just wanted the best for each other, even if they didn’t want it and the realisation of this brought tears to my eyes. The story is told from both Hannah and Tom’s point of view which helps add to the emotional feel of the book as the reader is privy to both of the characters inner most thoughts and feelings. Both of the characters are really relatable and easy to love which makes the reader a lot more involved with the story as you find yourself really caring about what happens. I loved Tom’s goofyness, how he always tried to make everything fun and be everything that Hannah needed. My heart went out to him as I can only imagine how hard the situation must be for him and how difficult it must be to not let Hannah’s illness rule their lives. Hannah is brilliantly described as the moody, embarrassed teenager but it’s clearly obvious to the reader how much she does care and worry about her dad which was very poignant to read about. This is such a wonderful, engrossing story that I so enjoyed reading and one that will definitely stay with me. I can’t wait to read more from this talented author. Hannah has a heart condition and she and Dad Tom need to come to terms with life as it is. Now, I’m going to be completely honest. I don’t think Days of Wonder will be everyone’s cup of tea and I think some readers will find it slightly too sentimental – a bit like an old black and white movie. For me, however, it was a complete and utter joy to read. It touched me heart and soul and I loved it. And, after all, fairy tales play a vital role in this story so no wonder I thought it was a magical re Hannah has a heart condition and she and Dad Tom need to come to terms with life as it is. Now, I’m going to be completely honest. I don’t think Days of Wonder will be everyone’s cup of tea and I think some readers will find it slightly too sentimental – a bit like an old black and white movie. For me, however, it was a complete and utter joy to read. It touched me heart and soul and I loved it. And, after all, fairy tales play a vital role in this story so no wonder I thought it was a magical read. Days of Wonder is such a cleverly structured book. As well as being a straightforward narrative about a girl, Hannah, and her father, Tom, it is a multi-layered allegorical tale in which the theatrical metaphor is beautifully handled and consistent throughout. It’s not just that the plot revolves around Hannah’s illness and her and her father’s link to Willow Tree Theatre, but that Keith Stuart illustrates perfectly how, just like actors, we have different roles and personas that we present to the world and how we can sometimes delude and convince ourselves far better than we can those witnessing our performance. He writes with such insight and compassion that I had to put my life on hold until I had read every word. I love Keith Stuart’s style. His dialogue is natural and the way in which the Hannah and Tom’s narrative voices speak directly to the reader had me hooked from the first word to the last. I thought the title, Days of Wonder, was a superlative choice. We all need our ‘days of wonder’ and Keith Stuart illustrates this will incredible skill, so that I can honestly say reading Days of Wonder has actually changed me as an individual and I am approaching life differently as a result of reading this magical book. I loved every character, especially Margaret and even those like Phil, because they felt so vivid and real. Whilst Hannah is the joint protagonist, it was Tom who appealed to me most. He’s hapless, flawed and so convincing as a father, struggling to do his best and not always being successful. I thought the balance of power in his relationship with daughter Hannah was perfectly poised so that I felt more like a fly on the wall in their home than a reader reading a book. Enormous credit must also be given to Keith Stuart for the way he has tackled the emotive subject of heart conditions and their treatment with such skill, knowledge and humanity. The reader has no idea how much of a happy ending there might be for Hannah and this is what makes Days of Wonder all the more fabulous. Despite the fact that Hannah could face death at any moment, there’s such humour in the book too. I laughed, but certainly I cried quite a bit more. Reading Days of Wonder gave a kind of poignant ache in my heart and I found it a wonderful read. An emotional storyline, characters you really care about, an element of romance and some added drama to keep you turning the pages: Days of Wonder hooked me from the first page right through to the last. I don't want to give too much away about what happens, but I will say that this is an emotional read and you should prepare yourself with tissues if you're anything like me (emotional and very quick to cry!). As the synopsis reveals, single dad Tom's daughter, Hannah, is suffering from a serious heart condition, and he's struggling to cope with what they both know is coming - but he's truly doing his best to try and keep an element of magic in her life. Day of Wonder is not just about this awful situation, though - there's so much else going on. From the theatre in peril to Tom's romantic life (or lack thereof), we're there every step of the way with them, and I found by the end of the novel I really cared about what would happen - meaning every emotion felt even more intense! Their relationship is amazing, and Tom especially is such a great character, striking just the right balance between being lovably hopeless in some areas, and incredibly creative and capable in others. There are humorous parts and really sad parts, but whatever was happening within its pages, I loved every second of it - it all felt real and convincing, and made me want to find out more about Hannah's condition. I read A Boy Made of Blocks, also by Keith Stuart, and hugely enjoyed it, so I was excited to give his newest novel a go. I certainly wasn't disappointed, so I'd really recommend this to anyone looking for a heart-wrenching, wonderful read. I loved both Tom and Hannah, although I definitely had more of a soft spot for Tom, maybe even a slight book crush. They felt so real and I felt like I was actually part of their lives, not just a fly on the wall. I loved the way Hannah and Tom told their stories through alternating chapters, revealing their close father/daughter relationship. I loved all the theatre, fairy tale, and comic book analogies, it made me want to read fairy tales again and try comic books. Any recommendations of where to start? I loved everyone in the drama group, they made me want to join in, especially the trip to the drama festival with the cheap cider and acrobatic insect troupe! I loved Tom’s dating adventures and really loved the sound of that adult music lesson. Where can I find one of those near me? I loved the character development of both Hannah growing up, and Tom learning to let go. I loved the comic book shop even though I’m not a comic book fan, but I wanted to hang out there with Hannah. I loved how it made me smile, laugh out loud and nearly cry. It had such a sense of hope and wonder all the way through, making me think about my own life and how I might treasure and enjoy everything and everyone around me more. I loved that I’ve found a new favourite author in Keith Stuart. I could tell you about so many other moments that I loved, but that would ruin the story for you. It’s one of my favourite books this year and I will definitely be getting myself a paper copy so I can re-read it. I’m going to be recommending this to friends, family and, given the chance complete strangers! Thanks so much to Clara Diaz at Little, Brown Book Group and NetGalley for my digital ARC. Delightfully wonderful!! This is one of those books that I was a little apprehensive in picking up, after loving The Boy Made of Blocks so much, as I always worry that the follow up won't be as fabulous. But within a few pages I was emotionally involved with the father and daughter who this story revolves around, and the tenderness and respect between these characters was just so charming that you cannot help but keep turning the pages as you are eager to find out what challenges they are set to Delightfully wonderful!! This is one of those books that I was a little apprehensive in picking up, after loving The Boy Made of Blocks so much, as I always worry that the follow up won't be as fabulous. But within a few pages I was emotionally involved with the father and daughter who this story revolves around, and the tenderness and respect between these characters was just so charming that you cannot help but keep turning the pages as you are eager to find out what challenges they are set to face and hopefully conquer! There's always been a strong bond between Tom and his daughter Hannah, as he has bought her up on his own and has had to be there for her as she fights her illness, a heart condition that has led to many restrictions on her life. But they've faced these things together and he's always looking for ways to make each day more magical for her, and each year on her birthday actors from the local theatre that he runs, put on a play for her. Within the group there are such a wide range of characters that add a nice mix to the story, and they all become like a little family as they're all so involved with each others' lives. Hannah is always a realist though and is looking for her dad to find some happiness and so the story is also told from her point of view as she shares her own viewpoint on how challenging she finds her life and those that she meets along the way. She soon becomes close to Callum at her school, and he's not without his own problems, so she gets him involved in helping to find some romance for her dad. I didn’t think that Keith Stuart would be able to write a book any better than ‘A Boy Made of Blocks’ which I adored, but in ‘Days of Wonder’ he has managed to do so with ease. A story that takes you on an emotional rollercoaster of a ride, literally making you laugh out loud one moment and then burst into tears the next. With characters you can’t help but fall in love with, you feel every emotion right along with them. Beautifully written, ‘Days of Wonder’ is a heartwarming story of family and I didn’t think that Keith Stuart would be able to write a book any better than ‘A Boy Made of Blocks’ which I adored, but in ‘Days of Wonder’ he has managed to do so with ease. A story that takes you on an emotional rollercoaster of a ride, literally making you laugh out loud one moment and then burst into tears the next. With characters you can’t help but fall in love with, you feel every emotion right along with them. Beautifully written, ‘Days of Wonder’ is a heartwarming story of family and the love a father has for his daughter who has a life limiting illness. It is written with warmth and humour, is at times heartbreaking, but is ultimately a story of hope. There isn’t anything I didn’t love about this book, and it is easily my favourite read of the year so far. I savoured every word and did not want this wondrous journey with Hannah, Tom and the Willow Tree Theatre to ever come to an end. An incredible read and one that will stay with me for some time to come. A very easy 5 stars. Alright everyone, grab yourself a cup of tea and a slice of cake, have the tissues close by and be prepared to fall in love with the stunning new novel from Keith Stuart, who has a way with words that defies description. It has been Tom and is little girl Hannah for as long as anyone can remember and when Hannah was diagnosed with a heart condition that will limit her life, Tom throws himself into making every day as magical as he can for his daughter. Managing the local theatre makes it a very i Alright everyone, grab yourself a cup of tea and a slice of cake, have the tissues close by and be prepared to fall in love with the stunning new novel from Keith Stuart, who has a way with words that defies description. I laughed, I cried, and I felt every single word on every single page of DAYS OF WONDER by Keith Stuart. The characters are relatable, loveable, and completely realistic and I fell in love with them from the beginning. The writing in this novel really has its own unique quality which is difficult to describe so I will stick with this one word: magical. DAYS OF WONDER is the stunning new story from the author who melted my heart with A Boy Made of Blocks, and I will be shocked if it does not become a bestseller immediately!! Days of Wonder is the gem of a book that you pick up and it draws you in, it's based around Hannah who has a rare heart condition and her father who has been a single parent most of her life. This book brings the theatre to life, it weaves stories within stories and brings the magic of fairytales to centre stage. Hannah has struggled for a long time with her heart condition and alongside her Dad they have both found coping mechanisms and love within their theatre family. A book that makes you wan Days of Wonder is the gem of a book that you pick up and it draws you in, it's based around Hannah who has a rare heart condition and her father who has been a single parent most of her life. Oh Wow. Here is a list of words to describe this story… Beautiful. Powerful. Emotional. Heart-warming. Bold. Touching. Heart-breaking. Wonderful. Outstanding. Brave. This story had me feeling a whole range of emotions from happy to sad. I actually cried towards the end and not many books make me cry… However, A Boy Made of Blocks made me cry too. This is such a beautiful story filled with love, hope, family and friends. Also a great community coming together. I absolutely loved every single chara Oh Wow. Here is a list of words to describe this story… Beautiful. Powerful. Emotional. Heart-warming. Bold. Touching. Heart-breaking. Wonderful. Outstanding. Brave. I absolutely loved every single character in this book. Days of Wonder is told through father (Tom) and daughter (Hannah). Hannah is one brave, determined and lovely girl. A character that makes you feel proud. A girl her age shouldn’t have to face what she has had to cope with. Tom is one devoted father wanting the best for his daughter no matter what. This story contains a powerful message that life has to go on… Life is what YOU make it and it’s good to lose yourself into books, theatre, art, music or whatever your form of escape is. Keith sure knows how to write beautiful, tear jerking stories that are real page turners. I absolutely fell in love with this book. It will stay close to my heart! What a completely enchanting book.! Principally this book was about the special and unique relationship between a parent and child; it was about loving, giving, believing, letting people in and letting them go. It dealt with the raw nature of human emotion but also dealt with the magic of the theatre, the magic of storytelling and the magic of mankind at its best. The story was supported (and I was utterly enraptured) by the cast of wonderful characters that made up Tom and Hannah's friends and What a completely enchanting book.! Principally this book was about the special and unique relationship between a parent and child; it was about loving, giving, believing, letting people in and letting them go. It dealt with the raw nature of human emotion but also dealt with the magic of the theatre, the magic of storytelling and the magic of mankind at its best. The story was supported (and I was utterly enraptured) by the cast of wonderful characters that made up Tom and Hannah's friends and the local theatre drama group: they were quirky, eclectic, completely three dimensional and so very endearing that everything in me wanted to leap into the page and join them. I am loathe to say more as I would not want to spoil a single moment of this gorgeous novel. I enjoyed Keith Stuart's last book but this one went straight to my heart. Let me start with what this book is not, it’s not gritty or gripping, it’s not depressing or morose even though it deals with the lives of a father and daughter growing up with a life limiting disease and it’s not an overly sentimental tear-fest as some books on this sort of subject are. So, what is it? For me, it is just a delight. It is poignant and thought-provoking, gentle and a bit magical. The story is strong and throughout I did wonder what the outcome would be but I wondered in the nicest Let me start with what this book is not, it’s not gritty or gripping, it’s not depressing or morose even though it deals with the lives of a father and daughter growing up with a life limiting disease and it’s not an overly sentimental tear-fest as some books on this sort of subject are. So, what is it? For me, it is just a delight. It is poignant and thought-provoking, gentle and a bit magical. The story is strong and throughout I did wonder what the outcome would be but I wondered in the nicest, gentlest way. It was funny and sad as well as endearing and uplifting, and the characters are wonderful. I have, as I think will be a common view, a real love for Margaret, some of her lines are brilliantly funny, as well as Tom and Hannah and in fact all of them! I loved the author’s first book - A Boy Made of Blocks; it was one of my outstanding reads of the year so I was absolutely delighted to see this new one but also wondered whether it would live up to my expectations. It certainly did that and more. This book is simply stunning. I am so pleased I read it and it will stay with me for a long time. This review has been hidden because it contains spoilers. To view it, click here. Two stars seems a bit harsh, let's call it 2.5. I was interested to read this book because of its plot centred on heart disease and, actually, I really liked how that aspect was dealt with - not just milked for drama but adding to the drama nonetheless. As someone who lives with heart failure, I found it an accurate reflection of the symptoms (physical and psychological). And the obligatory heart transplant story line, while in there, was not central and was not over-emotional/spiritual, just me Two stars seems a bit harsh, let's call it 2.5. I was interested to read this book because of its plot centred on heart disease and, actually, I really liked how that aspect was dealt with - not just milked for drama but adding to the drama nonetheless. As someone who lives with heart failure, I found it an accurate reflection of the symptoms (physical and psychological). And the obligatory heart transplant story line, while in there, was not central and was not over-emotional/spiritual, just mentioned in the epilogue really. That was a refreshing change!